From Clear’s Silat Phase 1 Vol 8: Upper Body Art. A destruction is any technique that disables part of the opponents body for 26 minutes or longer. At least the duration of the fight. This could be anything from nasty charlie horse that takes out the arm for a little less than half an hour to a broken limb that will never heal right again. Another Free Silat lesson. This one is brought to you by Clear’s Silat Phase 1 Vol 7. This free Silat lesson is brought to you by Clear’s Silat Phase 1 Vol 5. “putting your hips into it” will destroy the hip joint. Use you’re waist instead. This lesson is brought to you by Clear’s Silat Phase 1 Vol 5. Whole Body Power – One of the real secrets of 1 Touch Knockouts! 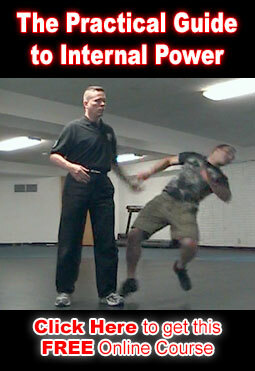 This free silat lesson from our class on “walking style” will teach you how to gain more power through proper leverage. Learn this and much more on Clear’s Silat Vol 4. This Free lesson is brought to you by Clear’s Silat Phase 1 Vol 4. Read more about the use of Smothering in Clear’s Silat. Free Silat Lesson 7: Ranges of Fighting. Brought to you by Clear’s Silat Volume 3. On Sale Through Nov 6. Learn more about the Ranges of Fighting.